Been done up as mentioned in the last review. Wide range of Arkells ales, didn't notice any guests. Decent range of ciders, again as mentioned. They've done a great job with the refurb, & it's good to see this sort of thing happening to a proper pub. On the downside, it's not my cup of tea, personally, part of the reason being a particular barstaff, & the prices. Credit where it's due, the place is worth a visit & it's a busy little watering hole. I've tried to be objective. Refurbished & reopened as an "ale & cider" pub, I'll Talk about the cider. While lacking things like Weston's Old Rosie, it does have a good range of "session ciders" such as Hermitage & Rosie Pig. It also has the usual Arkell Ales. The internal area looks very pleasant, as is the outside area, even if the latter is quite small. Main annoyance was Radio 1 music for this Radio3 audience. After missing out on The Wheatsheaf I ventured round the corner - skipped the Royal Oak - and found The Plough. Very pleasant little Arkell's pub with an acceptable pint of 3Bs. "Olde-worlde" style of interior with a little outside drinking/smoking area at the back. Didn't appear to do any food but had a quiet telly on in the corner. I got the impression that this was a local boozer where conversation took pride of place - and quite right too!! If I am ever back in Swindon I will use this pub again - the "Old Town" still has a few decent pubs left! Excellent traditional local.Friendly landlord and clientele and a fine pint of 3b's. 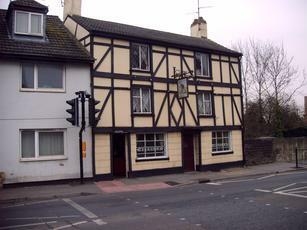 The photo is now up to date and the pub is the same as ever.